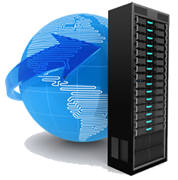 Wenex Media Works offers a number of full featured business web hosting packages for our web development clients, as well as site owners looking to migrate their web sites to a new hosting provider. The physical server space also features a number of safety and security features, including multiple redundant backup systems as well as 24/7 technical support service. We feature an extremely reliable, state-of-the-art server environment using either a Windows or Linux platform, with enough customization options to suit a wide range of web application technologies. Both of our Linux and Windows Web hosting plans include a number of server-side applications that can be used when developing and customizing web sites. We also feature and support a variety of popular Content Management System (CMS) applications such as WordPress, Drupal and Joomla. More often than not, e-mail services, hosting, and domain management are interconnected. We can provide this element of the online presence as well, from account setup and configuration, to management and troubleshooting, to e-mail based marketing and newsletter distribution. An SSL certificate on your web site builds a secure, encrypted connection between the browser and your Web server that lets visitors submit sensitive information, such as payment details, securely. We will assist you in reviewing your business needs and server configuration in order to select the best certificate for your requirements and how you plan to use the SSL certificate. We offer different certificate types, so before you purchase an SSL certificate this step is necessary because some websites or servers have specific SSL certificate requirements. Depending on the certificate type, we verify requests with the domain registrant and possibly other factors before we issue the signed certificate. When the certificate is issued, we will assist in downloading all of the files from your account and install them on your web server to secure your site. If your website is hosted with the same service that issues the SSL certificate, we automatically install it and update the IP address for your web site when your SSL certificate is approved. A domain name is the foundation of any great website. It’s more than just your address on the Web, it’s also your online brand, which is why choosing the right domain name is so important. You want something that’s unique, but still reflects your personality. Thankfully, with several top-level, country-code-specific, and now even industry-oriented domain names to choose from, your options are virtually limitless. We know that domain registration often accompanies a new web project. We provide this affordable service for the client, along with any supplemental domain management services, such as domain aliasing, forwarding, or renewal. Web analytics is the analysis and reporting of for the purpose of understanding and optimizing web usage. However, web site analytics is not just a process for measuring web traffic but can be used as a tool for business and market research, and to assess and improve the effectiveness of a web site. Web site analytics applications can also help companies measure the results of traditional print or broadcast advertising campaigns. It helps one to estimate how traffic to a web site changes after the launch of a new advertising campaign. It helps gauge traffic and popularity trends which is useful for market research. These are but a few of the many data types that can be used for reporting analytical results. Please contact us to learn about how we use and report web site performance.